We all know how bothersome multi-platform mobile app formatting can get. Each platform is unique and exhibits different features, capabilities and behavior. But then, multi-platform apps are truly “in” today, so you as the developer, need to find solutions to develop the best cross-formatted apps, without emptying up all your resources on developing for just a couple of platforms at one time. Fortunately for you, there are some really great multi-platform developer tools in the market today, using which you can easily achieve your aim. Here is a list of the top 5 dev tools for cross-formatting mobile applications. RhoMobile offers Rhodes, which is an open-source framework based on Ruby. This permits the developer to create native apps, spanning over a stunning range of OS’ and smartphones. The OS’ include Android, Windows Mobile, Symbian, iPhone and RIM, which pretty much covers it all. The framework supplied by RhoMobile is such that you only need to code once. This code can be used to build apps for most of the major smartphones. Native apps are great for working with available hardware, so your job gets done with ease, speed and accuracy. RhoMobile also offers developers RhoHub, which is a hosted development environment, and RhoSync, which can be employed as a standalone server to keep all the app data current on the users’ handhelds. PhoneGap allows the developer to work with device hardware features such as accelerometer, GPS/location, camera, sound and much more. PhoneGap additionally offers an Adobe AIR app and also online training courses to help the developer access native API’s and build mobile apps on its own platform. Additionally, Appcelerator also offers customizable metrics for actions and events. Apps can be totally hardware-based and all app data can be stored either in the cloud or on the device. MoSync offers support for several types of OS’, including Windows Mobile, Android, Symbian, Moblin and even a mobile Linux distro. Support for the iPhone OS and BlackBerry will be coming soon, after the release of MoSync 2.4. Included in this platform are source code editing, collaboration, debugging, project management, versioning and distribution. WidgetPad, which is now in private beta, can be used to create apps for the iOS, Android OS and WebOS. This one, though not really a top tool, is interesting. Whoop confidently states that they are “The one-stop mobile app publishing platform for non-developers”. Even if you are not a developer, you can still get some cross-formatting done with Whoop. Of course, we cannot guarantee that your product will have the same glossy look as those of your geeky coder counterparts, but Whoop is still definitely worth more than just a look. The Whoop Creative Studio is basically a WYSIWYG editor that lets you easily drag and drop mobile app elements onto it, to achieve desired effects. What is more, you can even export your app in many formats, depending on the OS, including Windows Mobile, BlackBerry, Android, iPhone and more. Top mobile publishers like Supercell, Machine Zone, and Kabam didn’t get to the top of the revenue charts by accident. They create amazing mobile experiences, they spend serious cash on user acquisition, and they optimize every single piece of the ad-spend ROI puzzle. If you find installs that are outside the window, you’ve got something to chat about on your next call with your account manager. Perhaps more interestingly, you can also test how different lookback windows for various different ad partners impact your conversion rate and user acquisition costs. Customer journeys are complex. Sometimes, so are app install pathways. It’s pretty clear why if you just check your own buying or app-installing psychology. You’re unlikely to install an app when you first hear about it, unless it comes with a stellar recommendation from a trusted friend or acquaintance, and scratches an itch you possess. But the second time, you might be a bit more likely. The third time, even more so. It’s important for you to know how many impressions it takes to optimize your users’ journey from never-heard-of-it to can’t-get-enough-of-it, and a big part of that is the app install invite to completed install. Does it take two ads? Three? Five? Perhaps even more importantly: which ad networks are helpers, and which are finishers? Both are important, and both can be necessary. Seeing the data gives you a better picture of what’s actually happening, and makes you smarter in future negotiations as well as partner selection. In addition, this report can show you instances of double-charging, where you’ve been charged twice for the same install. Your most profitable users might be multi-ethnic urban city-dwellers. They might be Spanish speaking. Or they might be rural farmers and ranchers. Whatever they are, you want to find more of them. Use an audience look-alike model to show common properties of your most engaged users, and then allow you to target audiences with similar properties. That gives you a double whammy: eliminating wasteful spend, and targeting users who are most likely to convert. For example, one dating app wanted to target men of a certain age, demographic profile, and economic status. This report helped them find the right people, and avoid targeting audiences that were more likely to contain women. Lookalikes are great, but sometimes you want to go by region as well. Use regional attribution reports to measure installs right down to the international postal or zip code to again target users who look like the best users you already have. Now you can slice and dice conversion, engagement, ROI, and LTV at a very tight regional level, and then segment your potential customers or users even further on nearly any attribute. Here, for example, is your engagement rate by international regions; useful information for app marketers wondering where to focus their dollars and attention. Most mobile users actively use 5-8 apps daily, with perhaps 10-20 more that they might use weekly, and a higher-yet number monthly. And some apps just live on their phones like zombies, there, waiting, but never actually used. If you’re not Facebook, Google, or a top game publisher, chances are your app is in one of the weekly, monthly, or (hopefully not) zombie categories. So re-engagement is a must: ads that ping users about new features, new products, new deals, or new functionality in your app, which they have already downloaded. But you have to know your ROI. Your re-engagement ROI report tells you how much you’re spending and how much you’re making. This is particularly important as your userbase matures. Not all ad partners need to be on an identical attribution model, and mobile marketers should definitely consider different attribution models for different ad types. For instance, video ads and banner ads are not the same, don’t get the same level of engagement, and have widely divergent ability to impact behavior. So attribution model reports can give mobile marketers a better sense of which models might be best in which situations. For example, you might choose linear attribution, where each interaction gets equal credit, time-decay based attribution where more recent interactions get more credit than older ones, or position-based attribution, with perhaps 40% goes to the first interaction, 40% to the last one, and 20% to the middle. Mobile marketing is complex enough. Your reporting should simplify, not exacerbate the challenges. So a report that combines data from all your partners and all your organic installs, measure them at the most granular level, and also present you with a 30,000-foot executive summary is critical, as is the ability to dive into detail on a per-partner basis. Ultimately, the goal is simple: sorted, organized, and structured information at your fingertips so that you make smart, data-driven decisions. Facebook had another strong quarter, beating estimates to start 2017. It scored $8.03 billion in revenue and $1.04 GAAP actual EPS in Q1 compared to $0.87 EPS estimate. It earned that from 1.94 billion users, up from 1.86 billion last quarter, growing at a faster 4.3 percent compared to 3.91 perecent last quarter. At this rate Facebook should hit 2 billion total users in Q2. Daily active users reached 1.28 billion, up from 1.23 billion last quarter. While fake news, video violence, and copying Snapchat have all been fixtures of the Facebook news cycle, its user growth actually grew during the time period. Facebook added 3 million monthly users in the lucrative but saturated US & Canada market, though the Asia-Pacific region was the big driver, where Facebook added 43 million users. The company told investors that “Facebook is no longer reporting non-GAAP expenses, income, tax rate, and earnings per share (EPS).” That means it will be more prominently disclosing stock-based compensation in its expenses, which is important since tech companies like Facebook pay employees lots of stock that vests over time to keep them from leaving. Facebook beat analyst estimates on revenue, which were $7.83 billion. Facebook had closed the market earlier today down 0.68 percent at $151.80. Shares dropped 2.37 percent in after-hours trading. Today’s report shows that running out of News Feed ad space hasn’t prevented Facebook from continuing to grow its revenue. Mobile now counts for 85 percent of Facebook’s ad revenue, compared to 84 percent last quarter, accounting for $6.7 billion in ad revenue. Facebook earned $3.06 billion in profit in Q1, up 76% year-over-year while revenue grew 49% year-over-year. Facebook managed to slow the decline of its games payments business, with it earning $175 million in Q1 compared to $180 million last quarter and $195 million in Q3. Facebook stopped reporting mobile-only users. Headcount grew to 18,770 people, up 38 percent YOY. Facebook’s total costs were $4.7 billion, giving it a 41% operating margin, down from 52% margin last quarter. Facebook’s focus on the developing world with apps like the 200 million-user Facebook Lite, recently rolled-out Messenger Lite, and new Instagram offline mode are paying off. Average revenue per user in the Rest Of World region hit $1.27, up 40% in a year. During the earnings call, Mark Zuckerberg gave an overview of Facebook’s work on its new mission to “build community” that the CEO described in his humanitarian manifesto in February. Progress includes getting people to join community groups, launching Community Help for organizing disaster and crisis relief, and launching Townhall to connect people to their elected representatives. One important piece of news from the call was the first indication of the performance of WhatsApp Status, the Facebook-owned messaging app’s Snapchat Stories clone. Zuckerberg said WhatsApp Status now has 175 million daily users just 10 weeks after launch, making it larger than Snapchat as a whole. The CEO seems bullish on outside developers helping Facebook to produce a wider ranger of AR content than Snap can itself. When asked about monetizing AR, Zuckerberg brought up how object recognition could enable floating Buy buttons on real world things. Another significant point from the call was Facebook’s growing emphasis on long-form video and purposeful viewing, rather than the short-form video people spontaneously discover in the feed today. Efforts to thwart ad blockers have also succeeded, with CFO David Wehner saying Facebook served 32% more ad impressions in Q1 2017 versus Q1 2016.
eMarketer estimates that Facebook will generate $36.29 billion in net digital ad revenue in 2017, up 35% from last year. That would give it the second largest share of the global online ad market with16.2%, behind Google’s 33%. 45% of Facebook ad revenue is expected to come from the US. While Facebook doesn’t break out Instagram financials, eMarketer expects it to earn $3.92 billion in global ad revenue, or 12.3% of Facebook’s ad revenue. Q1 saw Facebook spin up several new products that could turn into serious money-makers for the social network. Following the success of Instagram Stories, Facebook continued its efforts to clone Snapchat with the launch of Messenger Day, Facebook Stories, and WhatsApp Status. These clones could dampen growth for Snapchat while eventually sucking in marketing dollars from the ads it will likely insert between Stories as it does on Instagram. Competing with LinkedIn, Facebook launched job opening posts that can be turned into ads. Facebook began testing ad breaks inside of recorded videos as well as Live broadcasts, and will keep 45% of the ad revenue while paying creators 55%. But Facebook saw trouble with Oculus, paying $300 million (plus $200 million from Oculus founders) to Zenimax after losing a lawsuit about stolen intellectual property. Co-founder Palmer Luckey left the company, and Oculus reduced the price of its Rift headset amidst slow sales of tethered VR hardware across the industry. The biggest story of the quarter was Facebook’s on-going struggles to fight fake news and offensive content. It’s begun working with outside fact checkers, hired a former New York Times product manager to run news product, made banned content reporting easier, and today announced it will hire 3000 people to speed up vetting of flagged content. Yet even that controversy hasn’t seemed to slow down the social juggernaut. It has taken a while, but small businesses are finally realizing the potential of mobile apps to gain more customers and increase sales. 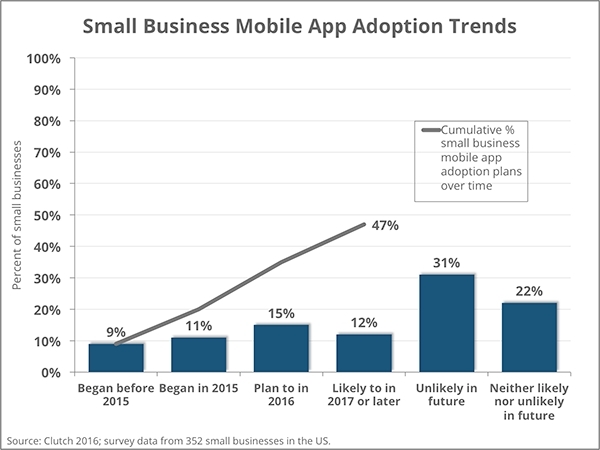 According to a new survey by B2B research company Clutch, nearly 50 percent of small businesses will have mobile app by 2017. That’s impressive considering only 20 percent of small businesses have mobile apps today. “Three years ago, a small business might see 10 percent of its total traffic coming from mobile, but right now it’s closer to 70 percent. Within the next couple of years, a shift to a mobile app or a mobile-friendly site will become obvious,” says Viktor Marohnic, CEO of the app builder Shoutem. The survey has found that the majority of small businesses are building apps to increase sales (55 percent), improve customer experience (50 percent) and become competitive in a specific market (50 percent). Marhonic also adds that consumer-facing industries such as restaurants, churches, small event organizers, car dealers, and stores are the obvious adopters of mobile apps for small business. According to him, these businesses want to build loyalty programs and keep their customers informed. The survey findings support Marhonic’s assertion as it has been revealed that small businesses consider customer loyalty features (21 percent) as the most valuable feature of their current mobile app. Should You Opt for a Mobile App for Your Business? The big question now is whether or not you should go for a mobile app for your small business? Before you consider the option, you should know that apps are no longer a mere branding exercise for small businesses. From simplifying online purchases to providing easy-to-access information, apps provide several benefits for small business owners. It’s worth noting that for the business owners, there are various sophisticated software tools and app builders that are making their lives easier. These easy-to-use and affordable tools can get businesses started and help leverage the potential of apps. Founded in 2012, Clutch is a Washington DC based research firm. For the study, Clutch surveyed 352 owners or managers in the United States and asked if their small businesses will have a mobile app by 2017. Instagram has doubled its user base, to 700 million monthly actives in two years, fueled by Stories, web signups and better onboarding on low-end Android phones. Instagram’s growth rate is actually speeding up. It took just four months to add the last 100 million users since hitting 600 million in December, while it took six months to go from 500 million to 600 million. For reference, this makes Instagram more than twice the size of Twitter. Soon it might join Facebook’s other properties in the billion-user club, since WhatsApp and Messenger have 1.2 billion users and Facebook 1.8 billion. When asked if the launch of Snapchat clone Instagram Stories helped boost the app’s user count, a spokesperson told me, “Yes, it’s impacted growth and retention.” Instagram Stories reached 200 million daily active users earlier this month, eclipsing the 161 million total daily users Snap Inc. last announced. Instagram’s combined ephemeral and permanent messaging feature Direct, also inspired by Snapchat, recently hit 375 million monthly users. Instagram’s progress has come at the expense of Snapchat’s growth, which sank 82 percent since Instagram launched its Stories copycat in August. All eyes will be on Snap’s user count when it gives its first earnings report next month. Meanwhile, as Snap deprioritized foreign markets with lower ad rates, Instagram has continued to push its international presence. “Developing markets have always been important at Instagram,” says a spokesperson. “U.S. is our biggest market, but Brazil has long been our No. 2 (currently with 45 million users). Along with the U.K. and Japan, our other big markets include Indonesia, India and Turkey.” Now 80 percent of Instagram users are outside the U.S.
Instagram has been building products specifically for these users who can’t afford data plans or have weak connectivity. It just introduced offline mode on Android, and the company tells me it’s been focusing more on its mobile web experience as well as keeping the Android app’s file size to a minimum. With such a large audience, Instagram has the scale to appeal to top brands. The app now has 1 million active advertisers, up from 500,000 in September, with plans to offer them more data and flexibility. It’s rare for a social network to stay as cool after 6.5 years. Even its owner Facebook was starting to look a bit old at that point. But by sticking to its roots of visual communication while shrewdly adapting to new trends, Instagram has managed to stay on top. Mobile marketing is a term that has gained it’s importance in the marketing world. With 74% of (potential) customers, whether B2B or B2C nowadays saying that they are more likely to return to your website if it’s mobile-friendly, there’s no more denyingthat optimizing your mobile strategy is a must. Below are 3 golden tips on how to do so! Make your content, blog,website, submission forms, call-to-actions, emails etc. easy to read on mobile devices. Make sure it’s visually attractive and to optimize the navigation. It’s easier for reader to just scroll down your mobile blog when reading than having to move left and right because the content isn’t adjusted to mobile screens. Most customers prefer visiting a website on a desktop over visiting it on another mobile device. So make sure to have somewhat the same structure, lay-out and navigation. Also, make sure to incorporate a link to visitors can easily switch to a desktop screen if preferred. Mobile users might find it more handy to just watch your video, or listen to your content instead of actually reading it on a small screen (especially smartphones). Try to replace long texts by engaging audio and/or video content, your customers will most likely appreciate it! According to Ooyala’s Global Online Video Index Report, mobile videos with lots of content are being watched more by mobile users than short-form content ones. Jonathan Wilner, Ooyala’s Vice President, explained that the underlying reason why these long-form content mobile videos are becoming so popular, is that it is now seen as the equivalent to the TV is so many ways. It is the “adjunct of TV” and the availability of premium and long content videos on mobile devices that makes these mobile videos sometimes more pleasant and easier than the TV. While mobile devices accounted for 55% of America’s Internet usage in January 2014, it’s obvious that even B2B marketers can’t ignore the importance of mobile marketing anymore. Still not convinced? 74% of Americans say that they are more likely to return to a website if it’s mobile friendly. But what exactly is the best way for B2B marketers to set up such a mobile strategy? Here’s a handy 3-step guide. The main thing to do to grow your business and stimulate revenue, is by clearly defining your business ambition. Line out where you are now and what strategies and tactics you will use to grow your core business. Are you going to explore new markets and expand internationally? Or maybe you’re thinking of expanding the product lines? What are the critical factors that will stimulate growth? Defining your business ambition and how you will use it to grow your business, is one of the most crucial factors to wisely enter the B2B mobile market. The strategies and tactics that you will choose to grow your business, you can make mobile to achieve those goals. What are your customers looking for? Be sure to know the answer on this question. Listen to your customers and give them what they want, at anytime. The best way to be able to give your customers what they want 24/24, is via the mobile way. Researching what your customers are looking for, how they want to connect to your business mobile-wise and what your services can do to make their lives easier, will establish your liability and trust. After you’ve carefully thought through how your business ambition will help your business grow and how it can be approached on mobile devices, you can start thinking about the strategy and tactics to implement this. Start by thinking about the strategy first or “how will I approach my mobile objectives?”. Carefully describe what investments your business will have to make to meet your mobile strategy goals (capital, natural and human resources). Once you’ve defined that, you can implement your tactics or specific moves you are going to make to implement your mobile strategies. Specify the tasks that are needed to fulfill the goals and prioritize them. Don’t let the opportunity of mobile B2B marketing slip away, use its full potential and make your business grow! It seems another bold move by Facebook, considering that it dropped HTML5 a few years ago because they could not get the UX to work uniformly on both iOS and Android. This led to the complicated task of writing separate apps for iOS and Android, which invariably led to the React library. Since JS is a development language that pretty much all web developers know, React-Native has the capability to become a mainstay with developers who can quickly transfer/code apps between platforms, which would most likely lead to React becoming a self-sustaining open source project. JS is already open sourced and already has many libraries that can be combined with React to further accelerate development. While the developer will still need to write different user interfaces for the different platforms, the core build of the app will be the same which can significantly cut down on development time – hopefully eventually leading to the ability for developers to write the app once and have it run on any platform. Many of you might remember Summly, the news summary app developed by a 17-yr old Nick D’Aloisio. You might also remember, that D’Aloisio sold Summly to Yahoo for $30 million. Summly was shut down in March 2013, but Yahoo and D’Aloisio has taken the Summly app and improved upon it this past year. Yahoo News Digest was revealed at Yahoo’s keynote in January. It looks even better than Summly did, a sleek, very visual and highly functional news reader that presents you with headline news from Yahoo’s news network. It does this twice a day – once in the morning and once in the evening. Yahoo uses a combination of algorithms and human editors to select the dozen or so stories that it sends you. The result is spectacular in that it is easily one of the best-looking apps released over the past few years. It a complete departure from Yahoo’s usual style (although their weather app was a nice indication of what they could do). The app is visually pleasing while being functional at the same time – it gives you news in small, digestible chunks of information that has an “end”. Yahoo’s News Digest is different from apps like Flipboard and Feedly, in that it has a finite amount of articles that it gives you – hence, giving the reader a satisfaction of finishing something. Readers can choose to keep reading if they’d like (just scroll past the “Done” screen if you want to keep reading other stories). Having already won the Apple Design Award for 2014, Yahoo News Digest is our best designed app of the year!